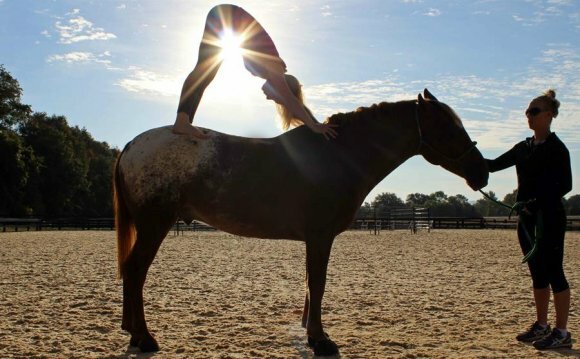 Try yoga on horseback, starting with sunrise yoga in the stables and then moving to the round pen. This will help you communicate bette with horses and people. I know that yoga is good for riders, but had never thought about trying yoga on a horse. At Salamander Resort in Middleburg, Virginia, Angela Nunez has carved out a unique niche. We started out at sunrise in the stables for a warm up session. Yoga in the hall of my local barn isn’t something I’d necessarily think about, but the stables at Salamander are kept meticulously clean and it’s super Zen to do yoga while horses hang out in their stalls- probably very confusing for them as well. Next we moved into the round pen, where Angela and two spotters helped me through a session on horseback. Please note that I don’t do yoga at home, but there was something interesting about mounting up to try it… definitely a challenge. The theory behind it all is that by working more closely with your equine friend in a concerted, thoughtful way, you become a better communicator with your horse and thus a better equestrian. Becoming more limber and at ease with your mount is helpful, too, especially when both you and your horse are breaking out of your comfort zone. We started out with some simple twists at a walk and moved to a few more advanced poses. It takes a good, calm horse for this type of experience, but it’s not so far from some of my warm ups in my riding lessons, as we all stretch and ride and reach out and into a different realm, enjoying time with horses and learning more about each other in the process. Doesn’t that sound like a good ride?